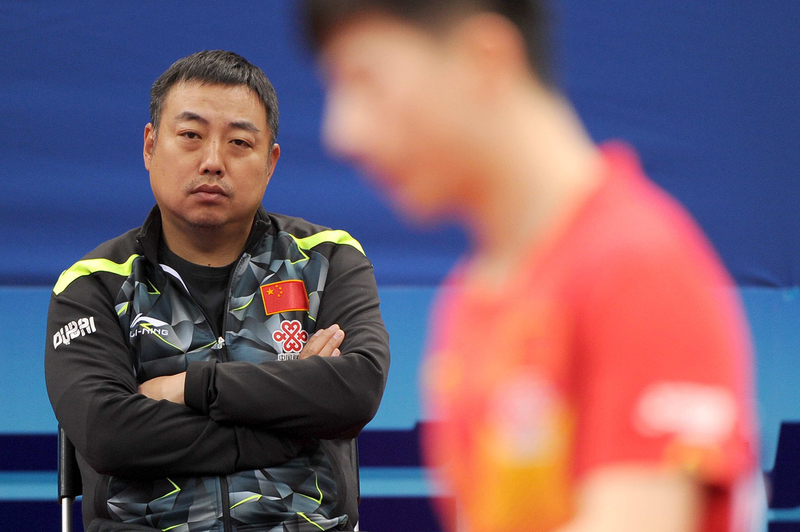 China’s then head table tennis coach Liu Guoliang watches Ma Long of China competing against Jeong Sangeun of South Korea in their men’s singles third round match during the Seamaster 23rd ITTF-Asian Table Tennis Championships 2017 in Wuxi city, in east China’s Jiangsu province, April 14, 2017. This article was first published by Chublic Opinion. It soon became clear that this was not a scheduling error, but an open revolt unprecedented in the history of Chinese Ping Pong. Liu Guoliang, to whom the Weibo posts were dedicated, was the Head Coach of China’s national Ping Pong team until three days earlier, when he was abruptly reassigned to the National Ping Pong Association as Vice Chair, a role widely believed to have no real power (there were 18 Vice Chairs ranking higher than him). A legendary Olympic champion himself, he was considered the most successful coach of the national team in a generation. Under his leadership, the Chinese Ping Pong team pocketed all four gold medals at the 2016 Rio Olympics. A new Ping Pong dynasty was just in the making. People were furious about his removal. At the stadium, realizing that they were probably witnessing history, spectators began to chant the name Liu Guoliang. When the video appeared on Weibo, it added fuel to the flame of anger ignited by the not-so-subtle protest from the athletes. The online storm created by the astonishing act of rebellion set off an intensive round of debate that represented competing narratives about what’s going on inside China’s state sport establishment. Befitting Ping Pong’s status as the country’s “national ball game,” the debate carried a microcosmic quality in the sense that within the seemingly narrow topic area of one sport was contained Chinese society’s many anxieties about governance, and its imagination about how reform should be brought about to a gargantuan, complex system. Heroes and villains clash in this little universe inside a Ping Pong ball, and people generate conflicting morals and lessons from the stories. From the public’s perspective, the heavy-handed demotion of a national sports hero and the poignancy in the athletes’ protest against that decision, perceived to be “suicidal” for their careers, reinforced a deep-rooted narrative about petulant, incompetent bureaucrats screwing up what’s treasured and cherished by the people based on misguided ideas and dogmas. In this case, that arrogant government official is Mr. Gou Zhongwen, China’s sport minister, who is widely believed to be behind this personnel change. Gou fits with the stereotype of the know-nothing-but-control-everything Chinese bureaucrat. First of all, he doesn’t have much of a track record in sports. Barely seven months in his current position, he used to be a vice mayor of Beijing and, before that, a technocrat managing China’s electronics industries. From the outset, he suffers from a credential deficit when placed side by side with Liu Guoliang. In Chinese, the expression “waihang guanli neihang” (the layperson manages the expert) captures a common critique of a top-down command-based system that does not value expertise. The idea of an electrical engineer “bossing around” a bunch of Ping Pong world champions is repulsive for many on line, even though in modern politics or business, lack of issue area expertise usually does not automatically bar someone from leadership positions, especially for so-called political appointees. Other materials emerged to support that damaging storyline. They showed him as having a history of insensitive “meddling” with otherwise well-functioning sectors, from Beijing’s metro system to the city’s middle school enrollment scheme. As vice mayor, he reportedly demanded the Beijing metro strictly limit the number of passengers in passenger cars, ignoring the miserable daily reality of rush hour Beijing commutes. Tales like this left no space for exploring the actual rationale behind such seemingly ridiculous policies. During this round of Gou-bashing, even more damaging materials were brought up to show him as not just incompetent but also corrupt. A businessman claimed on Weibo that Gou’s brother exploited Gou’s government connections to embezzle money from him. Those comments were quickly removed from the social media platform. Beneath these allegations and insinuations that portray Gou as an autocratic czar squandering China’s most loved sport lies a deeper suspicion. The familiar “power struggle” story once again proves its attractiveness. According to this version, Gou’s move is more calculated than it appears. His real target is Cai Zhenhua, the vice minister and someone with a much more solid power base in the sport establishment. A world champion himself, Cai used to be coach and mentor of Liu Guoliang in the 1990s, and is credited to have laid the foundation for the dynasty that Liu would later inherit. His monumental success propelled his rapid rise in the hierarchy of Chinese sport, from head of the Ping Pong and Badminton Center to Vice Minister, overseeing, most notably, the development of soccer, a sport embraced with high expectations from the country’s top leader. Many observers once believed that Cai was on the way to be the No. 1 person in Chinese sports. Gou’s appointment at the end of 2016 dashed those hopes. The appointment also fuels speculations about a possible schism between the two men: does Cai resent Gou for getting in the way of his much anticipated promotion? Does Gou see Cai as a threat to his authority in the sports administration? These questions are the building blocks for extended stories of how this Liu episode is part of Gou’s maneuver to undermine Cai. A winning Liu Guoliang, and his Ping Pong team, would supply Cai with a steady line of political capital, which would enable him to challenge the new minister’s agenda. In the highly watched field of soccer, the rivalry is already bubbling up in the eyes of some observers. The National Soccer Association’s decision to hire the Italian star coach Marcello Lippi at a time when the national team was desperately hanging on to the last remaining chance of qualifying for the 2018 World Cup in Russia was widely hailed as a wise move. However, the General Administration of Sports seemed to be unhappy with how much China paid for Lippi (a contract worth U.S.$23 million per year), issuing a notification criticizing the Association which Cai leads. Two weeks before Liu’s reassignment, his colleague Kong Linghui, another confidant of Cai and coach of the national women’s Ping Pong team, was recalled from an ongoing tournament in Germany and suspended from his job following revelations that he owed millions to a casino in Singapore. The disciplinary action might be justifiable. But when seen together with Liu’s dismissal, spectators connected the dots and completed a story of the new king trying to oust his disgruntled challenger. The episode reveals the Chinese public’s complicated emotional attachment to Ping Pong. On the one hand is the public’s intense disdain for the so-called central planning sports system (“juguotizhi”), a gold-medal-churning machinery that focuses the entire country’s public sports resources on a selected group of elite athletes; on the other is their profound affection for Olympic champions like Liu Guoliang, and the immense emotional investment in the idea of winning. The complex confounded even some of the savviest navigators of Chinese social media. On June 29, when the Communist Youth League tried to invoke patriotism on Weibo ahead of the 20th anniversary of the reversion of Hong Kong to China, it found itself being booed by thousands of otherwise patriotic followers airing their frustration with the sport administration, leading to an embarrassing retraction of the post. The 2012 London Olympics was an eruption point for the “anti-juguotizhi” sentiments on China’s nascent social media, triggered by a few disturbing and embarrassing incidents that summer, which deeply shook society’s faith in a system that pushed China to the top sections of Olympic medal ranking in recent Games. Liu Xiang’s unexpected dropping out from the 110-meter hurdles game due to an injury touched off a bitter round of bickering on Weibo about whether the state sports apparatus over-drilled him ahead of the London Games for the sake of a gold medal. Two Chinese women’s badminton players’ scandalous disqualification from the Games because of “passive play” added to the belief that a gold-medal-obsessed system had led China onto a path that totally disregarded the essence and spirit of sport. In that summer, the debate culminated with two editorials representing the zeitgeist, one by the liberal Caixin Media, whose Editor-in-Chief Hu Shuli declared that “taxpayers would ultimately grow tired of the ‘gold medal only mentality’,” and the other by the Party’s chief mouthpiece, People’s Daily, which asserted that elite athletes needed state support to excel in the games. It argued that good performance in the Olympics would inject “positive energy” to the whole country. The central planning system is not antagonistic to investments in “sport for the mass” (qunzhong tiyu) and should co-exist with other forms of support schemes. The People’s Daily editorial underscores the major fault line in public discussions about China’s athletic ambitions, which continues to define the contour of such debates today. The state-controlled system is pitched against a more liberalized structure where market, rather than government, “picks the winner” (as in which sports game ultimately prospers and becomes competitive); and a choice has to be made if public resources for sports are to benefit the general public or just a bunch of elite athletes. What’s interesting with the Ping Pong episode is how a public once so scornful of the system now defends its most symbolic heroes with such passion, while the man who actually commands the system now has to be defended as a reformer challenging the status quo. In a widely circulated post titled “Why would Wang Anshi touch the Army of Yue Fei?,” the author uses ancient Chinese legends to illuminate the situation today. Wang Anshi, the famed Song Dynasty reformer who lived 1,000 years ago, is known for his wide-ranging, resolute reforms that rolled over vast vested interests, causing vehement backlash from his contemporaries. Yue Fei, a tragic war hero who roamed China a century later than Wang, was called back from the battlefield while still winning, and forced to commit suicide due to malicious accusations of corrupt officials in the Emperor’s court. The two historical figures would never have met each other. But the author cleverly taps into the cultural symbolism of both and highlights the treacherous public opinion environment that Gou elicits. According to the author, Gou is exactly the kind of reformer that is trying to dismantle the central planning, gold-medal-oriented system. His previous moves, such as making basketball superstar Yao Ming the president of China’s Basketball Association, a non-government body, represent his intention to encourage more societal participation in the development of sports games. It should be sports professionals (like Yao Ming) who direct the future of games through market-oriented sports associations. The stereotype of “layperson directing the experts” does not really apply to Minister Gou, as he has been laboring to put experts in leadership positions. So why should Ping Pong be an exception? Despite the spectacular successes of the national team in recent years, Ping Pong has every symptom of an ailing system. Its gold medals are products of centrally controlled training bankrolled by taxpayer money. The country’s nascent professional Ping Pong league never takes off as elite athletes invariably prioritize national team presence, making commercial games empty-seated. Moving Liu Guoliang to the National Ping Pong Association is consistent to what’s happening to other sports. Other sympathetic commentators locate Gou’s reforms in the longer history of Communist China sport development and project him as the heir of his predecessor Wu Shaozu. Wu, who took the helm of Chinese sports in the era of Reform and Opening, made the first attempt to return sports from elites to the “mass” through the reconfiguration of the athletic apparatus. Fighting off the most radical proposal at that time to abolish the sports bureaucracy and embed its functions into the Ministry of Education, Wu Shaozu nevertheless made efforts to redistribute resources within the ministry that strengthened the “sports for the mass” arm vis a vis the elite sports sections. On his watch, China’s mass participation in sport prospered for a while, up to the point when the pseudo-scientific Qigong, endorsed by Wu as effective exercises, alarmed the top leadership as a political threat. Wu was removed from his position by end of the 1990s. And his two successors were too absorbed by China’s later bids for the Olympics to continue the emphasis on grassroots sports. The pendulum swung back toward getting as many gold medals as possible. Then came Minister Gou Zhongwen, who, according to his supporters, re-embarked on a journey that Wu left more than two decades ago. Through such narratives, Gou is recast as a determined yet flawed reformer, legitimate in his cause, but somehow mismanaging the process by single-mindedly “recalling a winning general from the battlefield,” underestimating the public backlash it could cause. Under this new frame, Liu Guoliang and his loyal players do not appear that heroic anymore. They become the vested interests that the reform is designed to bust. One Weibo post refers to the Head Coach’s power to distribute commercial interests among his team members, including brand sponsorship and advertisement commissions, which creates a system of favoritism. Removing Liu would destroy this web of patronage, hence the revolt from his beloved team members. An official statement from the General Administration of Sport confirms this narrative. While condemning the striking athletes as irresponsible and “denigrating the nation,” it also insisted that “sport reform is unstoppable” and that consensus of the importance and urgency of reform was much needed. All players were forced to apologize for their action and retract their controversial Weibo posts. Like many debates in China today, the reform narrative attracts its own critics, the leftist nationalists. In a WeChat post by a leftist account, the author attacks Gou’s reform as “extreme neo-liberalism” that will ultimately ruin Chinese sports. Market-oriented capital only seeks short-term returns, he argues. If the government retreats from the job of nurturing and supporting athletes from a young age, box-office-obsessed sports club bosses won’t step in to fill the gap. Rather, they will choose to import big-name foreign players to boost revenues, like what’s happening in China’s liberalized soccer industry. The attempt to bring soccer-style market reform to Ping Pong is a “malicious move by the neo-liberalists to undermine the glory of Chinese sports,” warns the post. It inherits the “worst part” of American professional sport, while willfully ignoring the robustness of government-backed sports support systems in the U.S. The deceitfully tiny plastic ball of Ping Pong carries a symbolic weight in China that seems to defy the gravity of politics as usual. To spin it, new Minister Gou might indeed need the political clout and wisdom of Wang Anshi.